Weekly curbside trash collection is available in the City of Colonial Heights through a public/private contract with the Central Virginia Waste Management Authority. The current contractor is Container First Services. Trash is collected once a week on Wednesday. When a holiday is observed on Wednesday, trash collection will be delayed one day. The City provides each resident with one 68-gallon trash cart (see image at right). Additional trash carts will be available for the purchase price of $60. To obtain a second cart, please contact the Utility Billing Office and the cost will be added to your next utility bill. Each additional cart will also result in an additional $2.10 monthly service fee. Limited amounts of bulky trash (like furniture, water heaters, TVs up to 50 inches, and other appliances) will be collected at the curb on your regular collection day. The amount should not exceed the capacity of a 1/2 ton pickup truck. Call the Trash Collection Hotline at (804)425-0500 or submit an online application for pickup at least 1 day prior to collection so ensure your pickup occurs and to receive any other information necessary regarding your items. Appliances that contain Freon (refrigerators, freezers, air conditioners) require special handling. A $10 fee must be paid in advance for the safe removal of the Freon prior to pickup. Submit your payment in advance to the City of Colonial Heights Treasurer's Office. Place your receipt of payment in a zip-lock bag and place it on or inside the appli9ance on the day of collection. Any refrigerator door(s) must either be removed or tightly secured for safety reasons. Collection of large amounts of bulky material (or more than would fit into a pickup truck) may require an additional fee. Collection may occur on a day that is different from your regular collection day. 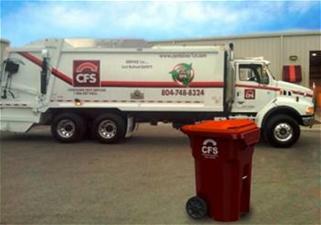 For questions about this service, contact the Trash Collection Hotline at 425-0500. Yard waste, such as grass clippings, weeds, leaves, and brush must be bagged and securely tied together or bundled. Brush must be tied in bundles less than 4 feet in length and weighing less than 75 pounds. Bagged leaves will be collected year round. The limit per collection is not to exceed the capacity of a 1/2 ton pickup truck. The 30 bags, each weighing no more than 50 pounds is included as part of the 1/2 ton pickup truck. Trash must be at the curb by 7:00 am on the scheduled collection day. Collection can occur up to 7:00 pm. Trash carts should have handles facing the house with the front of the cart facing the street. After being emptied, trash carts must be removed from the right-of-way and placed behind the front plane of a residence or business by 7:00 pm of the day following collection. Place extra trash in tied trash bags next to the cart for collection. Extra trash in personal trash cans will not be collected. Paints, motor oil, anti-freeze, and hazardous wastes will not be accepted. Click here for proper disposal options for these types of waste. Trash collection will not be affected by other holidays observed by the City of Colonial Heights. *Please note if the above mentioned holidays fall on a Monday, Tuesday, or Wednesday, trash collection will be delayed one day and collected on Thursday.